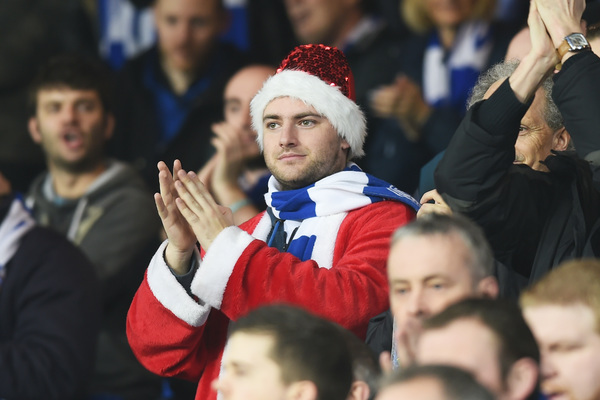 Good morning and welcome to The Independent's live coverage of Boxing Day’s jam-packed Premier League action. Forget the sales, forget going out to buy batteries, forget eating enough leftover turkey to make you sick, forget watching Fantastic Mr Fox on Channel 4 (actually don’t, it’s brilliant), the top-flight of the English game is the place to be today. All 20 Premier League teams compete in ten matches over nine hours of football hoping to mark Christmas 2015 with cheer, goodwill to all men and three points. I'm Sam Dymond, and I hadn’t checked the schedule when I volunteered to work today. Nevertheless, if you want to have your say on any match, then please either 'make a comment' using the facility above, tweet @sammydymond or send gift cards and e-presents to sam.dymond@gmail.com. ...and Mark Hughes makes just a single change to his Stoke team that were beaten at home by Crystal Palace a week ago. Their on-loan midfielder Marco van Ginkel misses out with utility man Geoff Cameron taking over for the Potters. There's one change for Manchester United too, but it's a significant one. 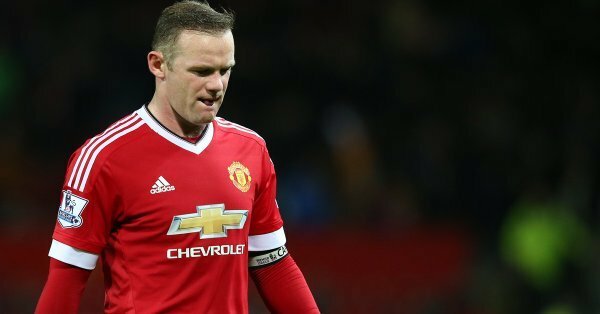 Following three consecutive defeats, Louis van Gaal has dropped captain Wayne Rooney to the bench; the Spanish midfielder Ander Herrera takes over from England's all-time record goalscorer. A content Wayne Rooney knows he has time to allow last night's selection box to settle. The IndependentThe last time Manchester United made the 50-mile journey to Stoke City on Boxing Day, they were up against it. Seven points adrift of the leaders Liverpool in the Premier League, the only positive in travelling to the Britannia Stadium in late December was the prospect of the biting wind blowing the jet lag out of Sir Alex Ferguson’s players following their gruelling flight back from Japan three days earlier. The IndependentThere is an unmistakable sense of what might have been with Mark Hughes when these Manchester United encounters crop up. In the past few years he has described subtly and without spite exactly how the light of the old Sir Alex Ferguson threat has gone out, from the perspective of those who now go up against his former team. And yet there was a time, not so long ago, when we thought it might have been him leading Old Trafford through the tumultuous post-Ferguson era. The teams exit the tunnel, and stream out on to the Britannia Stadium pitch ahead of what is a huge game in both Stoke and Manchester United's season. United's beleaguered boss Louis van Gaal has seen his side lose the last three matches in all competitions, and his unorthodox and quickfire press conference about mince pies a few days ago would suggest that he knows his job at Old Trafford is under pressure. Only a win today will help to alleviate such trouble. KICK-OFF: It's the visitors, wearing all black, who get Boxing Day's first Premier League fixture underway, knowing that they have failed to win in their last two visits to the Britannia. The hosts, the occasionally brilliant, often inconsistent, Stoke City have shown already this term that they are capable of beating the wheat - Manchester City and Bournemouth - and the chaff of Chelsea on home soil. 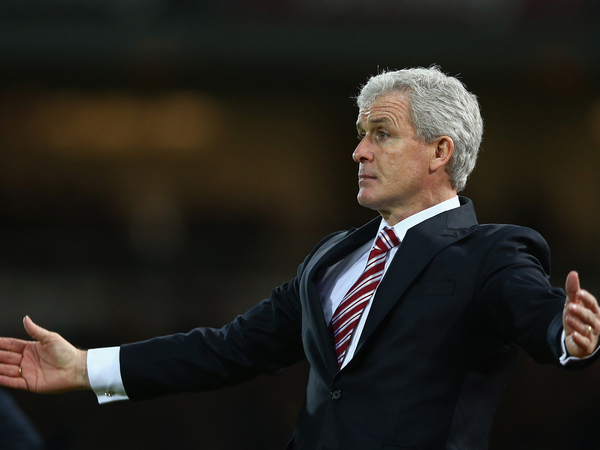 10 mins: Stoke have started off the better side here, with Marko Arnautovic looking dangerous. He fires a free-kick from close range wide of the left post though, but United certainly look the more nervous of the two teams. Schneiderlin on the bench? OK it's even LVG that wants to be sacked! Rooney dropped isn't bad. Schneiderlin should be on the pitch over Fellaini and Herrera at 10. 19 mins: GOAL FOR STOKE! 19 mins: Look away Louis van Gaal. There's not much the manager could have done about that one though. Fellaini is turned too easily but the ball over the top is heading back to De Gea. Depay is there to just nod it back, but he makes a complete hash of it and allows Glen Johnson in behind the defence. He crosses to an on-rushing Bojan, who takes a touch before nudging it home to open the scoring. 26 mins: GOAL FOR STOKE! 26 mins: Pick that one out De Gea! Bojan takes a free-kick just outside the United area, but it cannons back off the wall. United look to press out of their area, but it's Marko Arnautovic who reaches it first. He moves it out of his feet before unleashing a fierce effort that curls left and away from the grasp of De Gea, before finding the back of the net to double the lead. 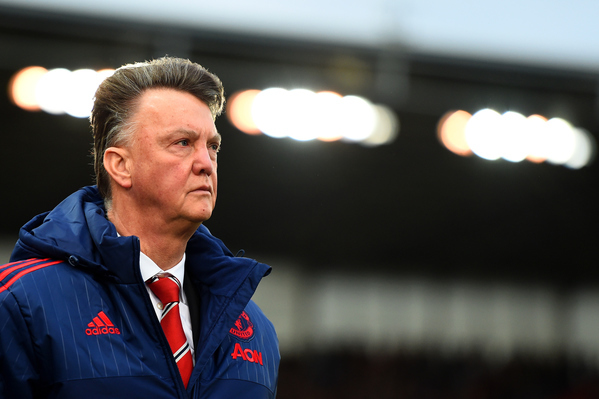 Is that the effort that spells the end for Van Gaal? It's hard to see otherwise. 32 mins: United win a corner that they really shouldn't have, given the ball clearly bounces off Martial before crossing the line. Play is delayed though with Pieters down and needing treatment after being caught on the knee by Young, who was trying to evade his challenge after knocking the ball beyond him. The defender is up on his feet but limping towards the sideline, but he should continue, and when the corner is delivered it's cleared by Johnson. Help from the powers above? 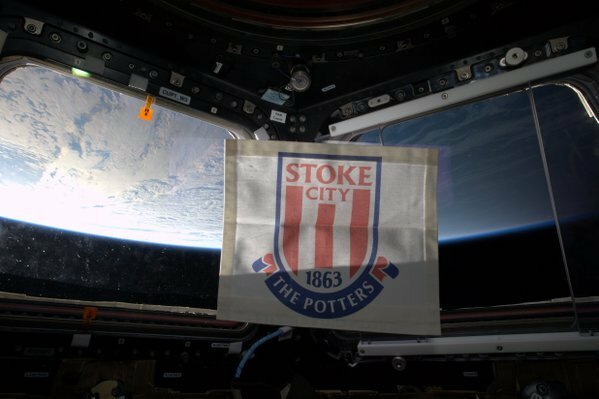 British astronaut Tim Peake shows his support for Stoke aboard the International Space Station. 35 mins: Martial look to try and knock the ball beyond Shawcross, but he goes down theatrically after no contact at all and referee Kevin Friend tells him to get up, momentarily reaching for his pocket to book the Frenchman only to decide otherwise. Immediately after, Bojan chips a ball over the top and Arnautovic is through on goal. He decides to strike it early, but misses to the left of the goal, much to his despair. 41 mins: Arnautovic is now down after colliding with Blind just inside the Stoke half. He looks pretty shook up as he collapses to the ground, though a bit of treatment to the head and chest sees him back up and over to the sideline. He looks certain to come back on, while Van Gaal and Giggs sit motionless on the United bench. They look shellshocked, and it must be hard for United fans to look on with such little passion coming from the dug-out. 45 + 2 mins: Mata wriggles clear to find some space and delivers a dangerous cross that Herrera tries to get his head onto. If he does, it's a glancing effort at best, and Butland is well placed to catch the ball before anyone else can get close to it. United attack again down the left, but Blind falls over as he tries to deliver and it sums up United's performance this half. Right, let's have some fun. If United fail to overturn the scoreline in the second half,. 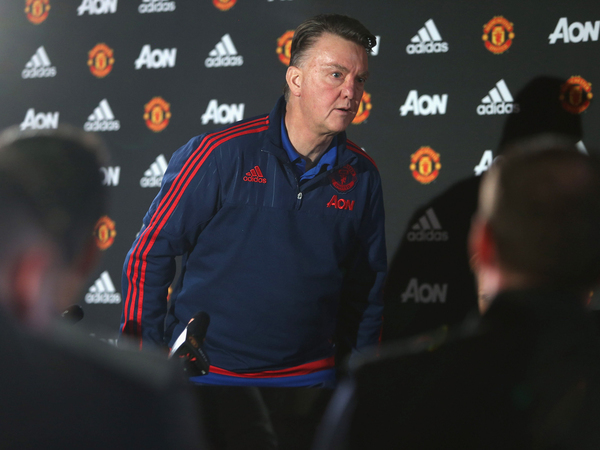 should Louis van Gaal pay the price today with a Boxing Day sacking? Or would United be stupid to dismiss the manager with the match against Chelsea coming so soon on Monday. Vote away! It really was a terrible half for United. They mustered one chance on target that saw a Fellaini rebound find the hands of Jack Butland, and the goalkeeper has not been tested since. Stoke on the other hand have looked very dangerous, and not just on the break. Arnautovic is again proving pivotal in anything around the United area, while Bojan has shown his class in both finishing his chance for the opener and setting up Arnautovic for what should have been a third goal. Van Gaal and Giggs are yet to show any signs of panic on the sideline, but Rooney is going through a rigorous warm-up at the break and looks certain to come on. 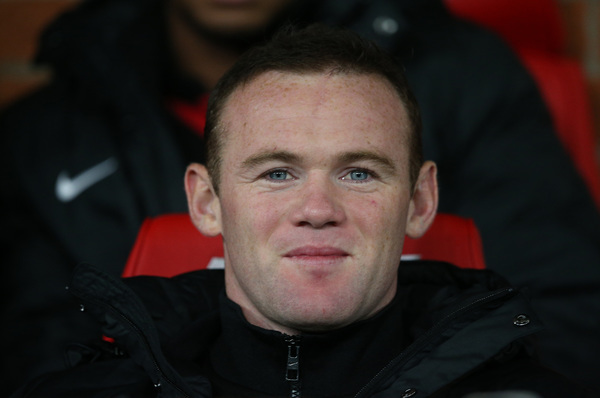 Can he change the game, or will e be the same lacklustre Rooney we've seen this season? A bad omen for United? 1980-81 - The last season Liverpool and Manchester United both finished outside the top four. Adrift. 26/12 - The last time that Man Utd came from 2+ goals behind to win a PL game was on Boxing Day 2013 (3-2 v Hull). Memories. There's the change, as Rooney comes on for the woeful Memphis Depay, while Stoke also make a change with Marco van Ginkel on for Glenn Whelan in what looks to be an injury-forced substitution. 46 mins: Stoke get the second half underway. 49 mins: Penalty? No, Bojan is booked for diving. The contact did look minimal, but why was the Spaniard booked when Martial got away with the same offence in the first half? Again, it was Arnautovic and Bojan who combined to unpick the United defence, but this time they get away with it. 57 mins: United appear to be taking a much more direct approach with Rooney now spearheading the attack and Martial out wide on the left. 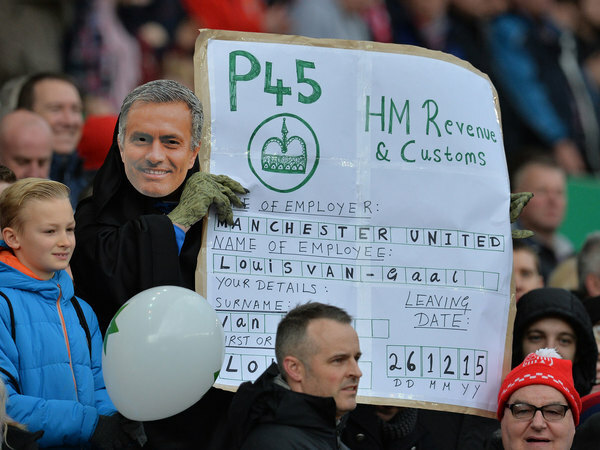 Stoke look more nervy, and the fans are voicing their concern each time they are closed down. This might not be over yet. 58 mins: Young breaks down the right after Pieters commits, and he fires a dangerous cross into the six-yard area where Rooney is surging forwards. He's offside though, and fails to get his head onto the ball anyway with the chance going begging. 62 mins: Martial is down injured and Stoke fans aren't happy with him, but the injury is justified as he caught a knee to the back of the head after hitting the floor. He appears quite dazed and you would call into question whether he has suffered a concussion there, as it was a nasty looking impact. But with Rooney already on, Van Gaal is limited on options to replace him with. 64 mins: Jack Butland, take a bow. The goalkeeper pulls off a fantastic one-handed save diving to his right to block a close-range effort from Fellaini, which was created by Rooney working his way to the by-line down the right. The goalkeeper palms it away to safety, and that shows why he's in the frame to replace Joe Hart as England's No 1. Shaqiri goes off with Mame Biram Diouf on in his place. 68 mins: Another chance for Stoke sees Affellay runs into the centre of the park. He feeds Arnautovic ahead of him, but despite jinking inside he can't work a chance and the ball falls to Douf instead. He's closed down by Smalling, and he moves the ball back to Affellay whose effort in untidy and balloons into the air and away to safety. Alarm bells were ringing for United though. 72 mins: Bojan tries to pick out Arnautovic in front of goal. Young is there to intercept the ball on the edge of the area, but he ends up poking the ball goal-bound and De Gea is forced to quickly change direction and prevent it going in the back of the net. Both teams now looking like they can and will score, the question is who? 82 mins: A last throw of the dice for the Manchester United who throw on Andreas Pereira for the last eight minutes in place of Anders Herrera.The Brazilian looks like Cristiano Ronaldo as he shoots glares to teammates around the pitch; United are going to need him to play like him too - and quick. 84 mins: Pereira makes his mark! Unfortunately it's on Ibrahim Afellay's torso as he holds the Stoke man back, stopping him from breaking away. It earns the substitute an instant yellow card. 88 mins: The linesman on the far side of the pitch is feeling in the festive mood, and helps Chris Smalling out after the United defender takes a wild swing at fresh air in attempting to dealing with a bouncing ball. It momentarily looks to have left Diouf through on goal, but the assistant referee shows good will to all men by flagging for a push that never happened. 90 mins: Juan Mata has a shot turned away at the near post by Jack Butland as the fourth official indicates three minutes of stoppage time. "Jose Mourinho!" sing the Stoke City fans. Or possibly the Manchester United fans. BREAKING: There's no point delaying the inevitable, so we are PAYING OUT on Louis Van Gaal to be the next #BPL manager sacked! Here come the teams. Lots and lots of teams. KICK-OFF: Leicester City, bottom of the pile a year ago, begin their match at Anfield top of the Premier League. That Christmas miracle is one of seven matches being played in the top-flight this afternoon and we'll have news of every important moment.